As you may remember, a week ago on Monday I was due another check-up and monthly dose of Pentamidine. Fortunately, the hematology clinic was really quiet that afternoon, hence it was all over and done with in a couple of hours or so. However, despite my hope that the run-of-the-mill cold I had would have gone by then, I wasn't that lucky, hence I also needed to have a mouth swab just to check whether the cold was something that could be treated; In all likelihood, the Prednisolone (steroid) dose that I was taking to sufficiently suppress my immune system to keep the skin GVHD from flaring-up was at the same time allowing the cold to hang-on in there. A couple of days later, the results of the mouth swab came back, and they showed that I had two infections: Parainfluenza Type 3 and Respiratory Syncytial Virus (RSV). The former just has to run its course, but the latter sometimes requires treatment in patients such as myself, due to being immuno-suppressed, hence I needed to go into hospital for an x-ray and for a doctor to listen to my breathing, so that a decision could be made. My x-ray actually looked fine, but my breathing was quite crackly, hence the doctor was leaning towards wanting to treat it, but left the final decision with myself. Whilst I didn't particularly want to spend more time in hospital, it seemed like having the treatment was probably the most sensible option, so I had to be admitted. The treatment for RSV is a drug called Ribavirin, which is administered via a nebuliser, i.e. the drug is aerosolised and then simply inhaled using a face mask. Unfortunately, it is a fairly lengthy treatment though, as to breath-in a full day's dose takes about six hours; Typically, it is prescribed for five or seven days. Personally, I had five days worth myself, before my breathing sounded fine, and I was discharged. However, even now (four days later), I still have a cough and runny nose. It does seem to be getting better though, and as of today my Prednisolone (steroid) dose was reduced from 30mg/day to 20mg/day, so hopefully that will help my immune system get on top of it. The Ribavirin treatment was quite comical in a way, as the equipment used to administer the drug was really poorly designed: The tube connecting the oxygen supply blew-off on a few occasions; The cap on the canister/chamber where the oxygen supply aerosolised the Ribavirin popped-out at one point, which made it more like a Ribavirin cauldron as the drug then bubbled-out all over the bed and floor; The tube connected to the face mask would gradually fill-up with fluid, which I got an unexpected shower in with the first dose, and ended-up all over the bed and floor a number of times with later doses (when it slipped the nurse's mind what direction the face mask was pointing); and the seals between the various parts of the equipment weren't quite right, so deposits of white powder would build-up and flake-off. Also, to the amusement of those that saw me in there, the white powder would gradually build-up on my nose each day too, so I looked like I had been snorting cocaine! Despite my expectation that there was a hidden camera in the room, and that I was secretly being filmed as some kind of Ribavirin equipment prank for a TV show, the closest that I actually got to any kind of entertainment was six long days of isolation with nothing to do but watch daytime TV, as the ward that I was in didn't even have the usual free WiFi access. I did think that the results of my skin biopsy would come back whilst I was in there, but I'm actually still waiting on those to confirm my recent case of skin GVHD. However, I did find out a couple of things of interest: the results of my chimerism test on day +102 showed that I was still 98% donor; and my hemaglobin and platelet counts seemed like they might finally be on their way up (unassisted). For now, I just need to carry-on with the usual daily preventative medications, i.e. Phenoxymethylpenicillin (anti-biotic), Aciclovir (anti-viral), Posaconazole (anti-fungal), Prednisolone (steroid for preventing skin GVHD) and Omeprazole (stomach protection from the steroid), and some daily calcium supplements (Adcal-D3). The general idea being that prevention is better than cure. The anti-biotic is a recent addition, which one of the doctors thought might be beneficial given the infections that I've had in the last month or so, and the anti-fungal is an alternative for the horrible tasting Itraconazole, which I mentioned in a recent post, that also turned-out to be what had been causing my diarrhea like symptoms for a few months. 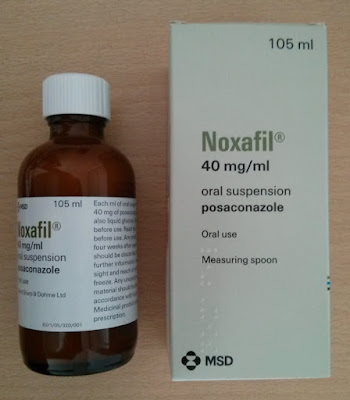 Thankfully, the Posaconazole is much better, as, not only does it taste alright, it doesn't seem to be causing any side effects. I can understand why the NHS prescribe the Itraconazole by default though, as it costs just under £60 a bottle (lasting about half a week), whereas the Posaconazole costs nearly £500 a bottle (lasting about a week). As you can see from the photo though, the manufacturer was kind enough to throw-in a free measuring spoon with each bottle! My next check-up is due on Monday, where my blood counts and progress with tapering off the Prednisolone (steroid) dose, whilst hopefully continuing to avoid the skin GVHD from flaring-up, will be reviewed by a doctor. Also, to add yet further embarrassment to what now must be the most rearranged dental check-up ever, I had to delay that appointment by another couple of weeks (this time to the 27th of June) to hopefully give my immune system enough of a chance to finally get rid of the cold! Today marks day +121 of my allogeneic stem cell transplant, and quite a few things have happened in the last few weeks. Shortly after my previous post, I started with a skin infection that looked very much like acne. It pretty much covered my chest, upper back, face and scalp, and there were the odd spots on my arms and stomach too. I wasn't a pretty sight, as it looked like all of my teenage spots had come at once! 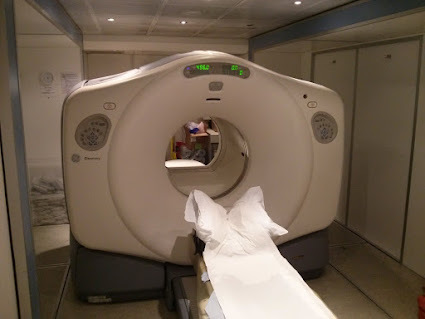 So, when I went for my bone marrow biopsy on day +102, the doctor that I saw prescribed some Flucloxacillin to help clear it all up, and hopefully avoid it showing-up on my PET-CT scan scheduled for day +105. Thankfully, the vast majority of the spots cleared-up quite quickly, and I was just left with the odd few that took a while longer. On day +102, the bone marrow biopsy went ahead as planned, and I also had two units of red blood cells, as my hemoglobin was once again low. It was also time to do another chimerism blood test to see whether I had changed from being 98% donor; Normally, the hospital does a chimerism blood test every month after day +28, but given mine was 98% at day +28 there was no need to do so, as I was considered full chimerism already. I'm still waiting on the results of the chimerism blood test, but they are likely somewhat redundant now, for reasons that I'll explain later on in this post. Although I kind of glossed-over the bone marrow biopsy above, it wasn't a very nice experience. 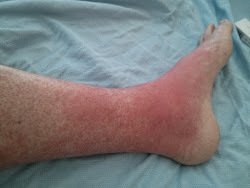 There were a few occasions when the doctor doing the procedure forewarned me that I was about to feel "a weird sensation" for several seconds, and if you replace "a weird sensation" for "nasty pain", the doctor was spot-on really; I do sometimes wonder whether the local anaesthetic really helps that much. The procedure is all over and done with fairly quickly though, so it's not that bad really, even if it does sometimes hurt a fair bit when they do it, and ache for a few days afterwards. In theory, the next step was a consultation on day +110 to discuss the results of the bone marrow biopsy and PET-CT scan. 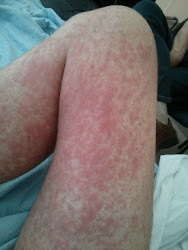 However, on day +108 I wasn't feeling so great, as I had a headache, loss of appetite, and was starting with a bit of rash (mostly on my lower legs and feet). When I checked my temperature that evening, it was above 38°C, hence when I got in touch with the hospital they asked me to come in, as I'd likely picked-up some kind of infection and would need some antibiotics via IV. I spent just short of a week in hospital being treated for the infection, which the blood cultures identified as Dermabacter Hominis. It was mostly treated with a course of the antibiotics Meropenem and Teicoplanin, but I was also on high-dose Amoxicillin for a day or two, until it was determined that particular antibiotic wasn't really needed. One of the doctors said that my skin GVHD would be classified as grade two, as it would have needed to cover my entire body for grade three, and blistered for grade four. I'd imagine grade four must be pretty uncomfortable, so I'm definitely glad that it didn't get that far. The treatment for the skin GVHD was mostly high-dose steroids, i.e. 60mg/day of Prednisolone; It appeared that the dose was calculated based on my weight, as I was prescribed 1mg/day for each kilogram of my weight. I was also prescribed Omeprazole to help my stomach with the side effects of the steroids. As you might imagine for skin issues, I was also given several creams to help with easing the burning sensation etc. One such cream was Levomenthol, i.e. 2% Menthol in Aqueous cream, and it was actually quite amusing the first time that that cream was applied, as the nurse that pretty much covered me in it got a little carried away; As I was shivering from its cooling effect, she was practically passing out from the fumes. 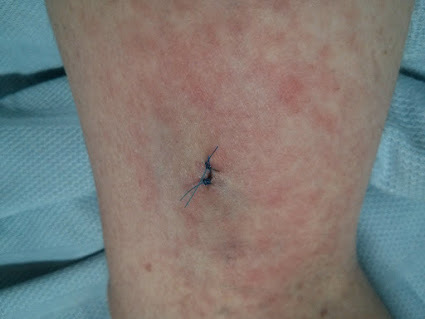 By the time the nurse finished, my eyes were watering, as I was like a giant polo mint! Although being in hospital meant that I missed my consultation on day +110 to discuss the results of the bone marrow biopsy and PET-CT scan, not to mention the dental appointment on day +112 (I've had to rearrange that so many times now that it is starting to get embarrassing), it did have the advantage that I was seeing various doctors on a daily basis, so as soon as the results were back, they would be able to discuss them with me. Eventually, I found out that my bone marrow biopsy was clear, i.e. there was still no sign of cancer in my bone marrow, so that isn't the cause of my platelets continuing to remain pretty low since my allogeneic stem cell transplant, and my PET-CT scan was now negative, i.e. there were no longer any areas of higher than normal activity showing-up. All in all, things are looking good really; I just need my hemoglobin and platelet counts to improve, which hopefully they will do so given time. Note: On the day of the skin biopsy (day +111), I actually had two units of red blood cells and two units of platelets, as I was feeling out-of-breath etc from my once again low hemaglobin count and the dermatology department don't like to proceed with a skin biopsy unless the patient's platelet level is above fifty (mine was in the twenties). Going forward, the plan at the minute is really just to see how things proceed with my blood counts, whilst gradually reducing the dose of Prednisolone to find the right balance of sufficiently suppressing my new immune system to keep the skin GVHD under control without at the same time overly increasing my risk of picking-up infections. As of day +117, my dose of Prednisolone had been reduced to 50mg/day, and my next check-up is scheduled for day +123, when I will go through the usual review process again, as well as have another dose of the monthly Pentamidine. I'm hoping that by then the run-of-the-mill cold that I currently have will be gone too! That really just leaves three final quick points: The chimerism blood test results are now somewhat academic, as the expectation is that after the recent run-in with skin GVHD, I will still be full chimerism; After a slightly embarrassing conversation with the receptionist at my dentist, I have rearranged my appointment yet again (for the 13th of June); and on the 9th of July I have an appointment with the consultant in charge of my case to discuss my progress, by which time I might have some of my stamina back!